New production Teatro Arriaga in coproduction with Opera Oviedo, Teatro Calderón de Valladolid and Teatro Villamarta de Jerez. Drusilla: Elena de la Merced. I don't remember Monteverdi’s Poppea ever having been performed in Bilbao, and if this wasn’t the first time ever, it was the first time in 50 years or so at least. This production had its premiere in Oviedo last September and came to Bilbao with the same stage production, same orchestra, same conductor, the same team of soloists and probably even the same extras. The only difference between the performances in Oviedo and Bilbao was the ticket price. In Oviedo the best seats cost 145 Euros, at the Teatro Arriaga only 55. 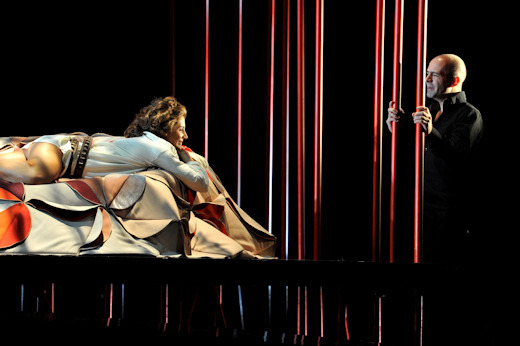 Emilio Sagi’s very fine production ismost appropriate for an Opera like Poppea. With Pierluigi Pizzi’s production last spring at Madrid’s Teatro Real still fresh in mind, I considerably prefer Sagi’s. Bringing the action to modern times is easily done with work as timeless as Poppea. Sagi presents the action on a fairly small stage with the use of mobile sets and a few atrezzo pieces. At first it looks simple, even simplistic, but works very well. The costumes for the women on stage are beautiful, colourful, and original and have an important part in the success of the production. The lighting, excellent from beginning to end should also be—as it were—highlighted. . The stage direction has a wonderful freshness about it and offers an excellent profile of the different characters, both the dramatic and the purely buffo, although in my opinion Sagi goes a little too far with the buffo roles. Sagi, with that particular, distinct touch common to all his productions, had created something remarkable with this Poppea. Musically, things were not at the same level. American harpsichordist Kenneth Weiss has been assistant to William Christie which makes for excellent credential, but between one and the other the difference is like that between master andstudent . , an advanced student if you will, but student all the same. The conductor and orchestra turned in a perfectly correct performance of the opera without excesses of brilliance. I missed particularly a more subtle playing in the great final scene from Ottavia. The particularly complete version presented included music that I had never heard before. Sabina Puértolas’ Poppea vocal suitability to the character is questionable for me. Poppea, apart from being fully credible on stage - Puértolas is fully convincing in this aspect - requires a voice with a good middle range since that’s precisely where its whole score is written. Still, I find her voice rather too light for my taste; an instrument that responds more to Drusilla than to Poppea. That said, Puértolas improved significantly in the second part, where she excelled in the two duets with Nero. Croatian countertenor Max Emmanuel Cencic wasn't a fortunate choice for the character of Nero. This singer gave a magnificent interpretation of Ottone at the Teatro Real, but the tessitura and requirements of both characters have little in common. On this occasion, Cencic’s voice offered unattractive sounds at the top, especially singing in forte. Dutch mezzo Christianne Stotjin was an excellent Ottavia, much improved from other performances I have seen from her in the past. She was at her best in "Disprezzata Regina" while I should have liked a bit more of emotion in "Addio Roma". Catalan countertenor Xavier Sábata was a very appropriate interpreter of Ottone, one of the most outstanding elements in the whole cast. Elena de la Merced was a perfectly suited Drusilla. She could have been also Poppea, with there not being much of a difference between her voice and Sabina Puértolas’s. José Manuel Zapata, who played Arnalta, mostly overacted, while switching between chest voice and pure falsetto more than once. Silvia Beltrami (La Nutrice), and Felipe Bou (Seneca) were both fine, and the part of Valletto was filled with a consummate singing-actor in Javier Abreu . Among the minor characters Marta Ubieta’s excellent Amore deserves first mention. Olatz Saitúa managed the parts of La Virtú and la Damigella nicely with her pleasant and small voice while María José Suárez capably performed Fortuna, Venus, and Pallas. If this Poppea has lasted 20 minutes longer than the one William Christie conducted in Madrid, that was a matter of the version chosen, rather than tempi.. When leaving the theatre, somebody was whistling the beautiful tune of “Pur ti miro, pur ti godo”. He may or may not have known that it wasn’t actually written by Monteverdi. In either case, it was already midnight and I found it a beautiful way to start a new day.